A hiker from Germany emailed me, inquiring when exactly the “climbing season” starts in the Philippines. I explained to him that unlike in the temperate regions where snow is snow and winter is a definite event, here in the Philippines the distinction between seasons is more or less arbitrary. What is definite, though, is the highlight of the climbing season, where a peak number of climbers go hiking: during the Holy Week. The Holy Week, by definition, always coincides with a full moon. The climbing season, by extension, may be defined as the season spanning three months of the lunar calendar, i.e. from the second to the fifth full moon of the month. These three months would coincide with the driest times of the year and most climbing activity is concenterated on these months. Following this logic, the climbing season for this year is about to start with the second full moon on February 9, and it will end on the fifth full moon, May 9. These early, various groups have events in the pipeline. Of course there is the 1st PinoyMountaineer Annual Charity Climb that will come at the heels of the climbing season (February 7-8) and the MFPI 30th Federation Climb will be held from April 16-19. 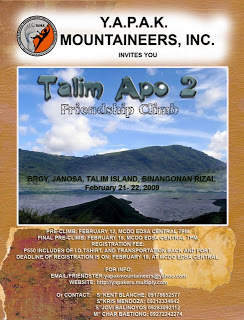 Organized by the YAPAK Mountaineers, this will be an overnight climb from February 21-22, 2009. The destination is Mt. Tagapo in Talim Island, “At the heart of Laguna Lake”. As a ‘friendship climb’, this is an easy destination, and being a non-mainstream destination I’m sure it will be novel experience for many. Contact Kent Blanche at 09178652577 for more details. The famous UPM is organizing yearly open climbs which they call “Talikasan”. 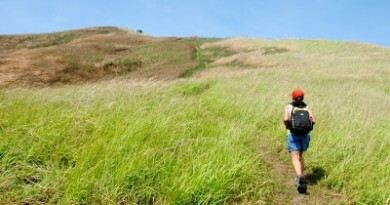 For this year, they have a Pico de Loro climb from February 21-22 and a Mt. Pulag via Ambangeg climb from March 13-16. According to them: “These trips are for novice and non-climbers, particularly students on a budget. 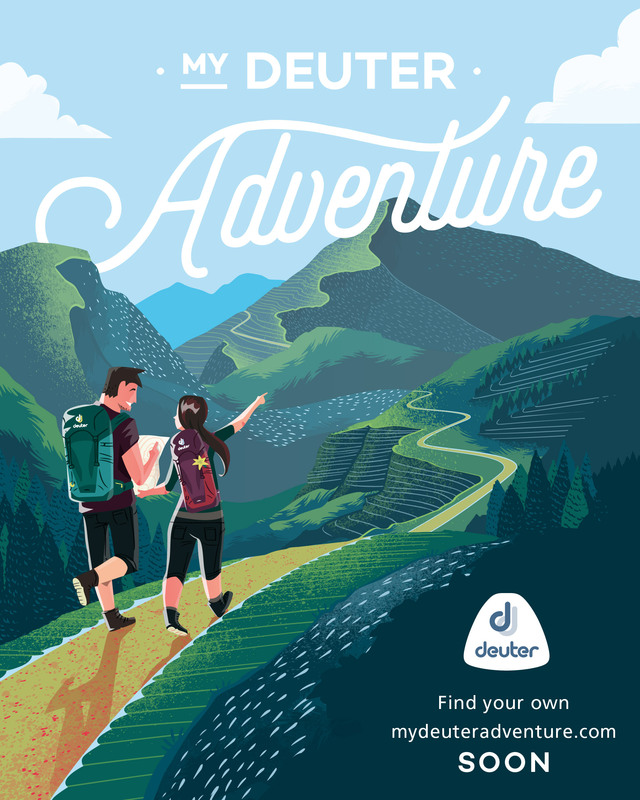 This is not your usual summer outing; the challenge you might have been waiting for.” For more information, email join@upmountaineers.org.ph. The local government of Besao – in the neighborhood of the famed town of Sagada – is promoting its own outdoor destinations, most notably Mt. Sisipitan in the 3rd Besao Adventure Trek. “Upon reaching the peak of Mt. Sisipitan – the highest point in Mt. 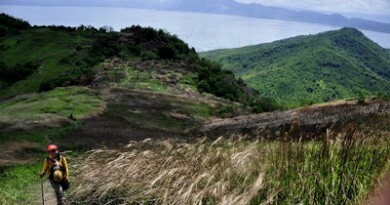 Province, South China Sea as well as other mountain summits and communities from other municipalities can be overlooked. See this and more by joining the adventure. 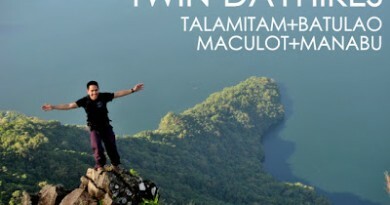 Just pack your camping gears and bring P1,500.00.” Tagpeo Falls, Banao Lake, and local terraces are other attractions. For more information, contact Gabriel Bayao at 09175592867.